This Beyonce show has some of the best commercials even if it has some weird sportsball dudes interrupting it. Anyway, the newest IRON MAN 3 trailer has shown up online. This particular trailer has an introduction by Iron Man himself, Robert Downey Jr. Thanks to the Iron Man 3 Facebook group for posting this trailer online. I know people are already bitching because the movie looks "dark and gritty" but I really think that writer/director Shane Black knows what's up. 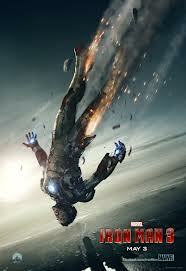 IRON MAN 3 is directed by Shane Black and will be released May 3, 2013 starring Robert Downey Jr., Gwyneth Paltrow, Don Cheadle, Guy Pearce, Rebecca Hall, Jon Favreau, and Ben Kingsley. Labels: Don Cheadle, Guy Pearce, Gwyneth Paltrow, Iron Man 3, Jon Favreau, Rebecca Hall, Robert Downey Jr., Shane Black, Sir Ben Kingsley.